The forest reveals a clue to Nicole's past; and Wynonna pays an unexpected visit to her mother. 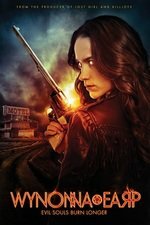 Den of Geek - Mama Earp breaks out of the mental institution, as a demon seeks to kill Waverly. Also, is Melanie Scrofano contractually required to bare her midriff in every scene now? I really hope future episodes explain all the crumbs that were littered throughout this episode. So many unanswered questions! I really loved that Nicole could not be drugged/duped into believing anything bad about Waverly. No amount of Jolene's pot pastries could turn her against her one true love.